There was, the widow carefully reported to the probate judge, no personal property at all left by her late husband. But when Jasper Robertson died in 1912, his widow Eula said, again and again, he left no personal property at all. Now The Legal Genealogist would never want to speak ill of a widow trying to get by and support her four children after the untimely death of her husband. And less in this case than in most: Jasper and Eula Robertson were my great grandparents. Not a pipe or a watch or a cup or a mug or a knife or a fork or a pot? Not a hoe or a rake or a plow? And yet he owned nothing? How in the world could that be? Easy answer, and the usual source for the answer. It’s because of the law. 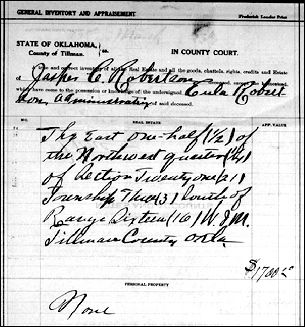 Oklahoma law, in this case, in a section of the law entitled Homestead and Exemption. And in the way homestead property was treated by the probate law. First. The homestead of the family, which shall consist of the home of the family, whether the title to the same shall be lodged in or owned by the husband or wife. Second. All the household and kitchen furniture. Third. Any lot or lots in a cemetery held for the purpose of sepulture. Fourth. All implements of husbandry used upon the homestead. Fifth. All tools, apparatus and books belonging to and used in any trade or profession. Sixth. The family library and all family portraits and pictures and wearing apparel. Seventh. Five milch cows and their calves under six months old. Eighth. One yoke of work oxen with necessary yokes and chains. Ninth. Two horses or two mules, and one wagon, cart or dray. Tenth. One carriage or buggy. Thirteenth. Twenty head of sheep. Fourteenth. All saddles, bridles and harness necessary for the use of the family. Fifteenth. All provisions and forage on hand, or growing for home consumption, and for the use of exempt stock for one year. Second. A pew or other sitting in any house of worship. Third. A lot or lots in any burial ground. Fourth. The family Bible and all school books used by the family, and all other books used as a part of the family library, not exceeding in value one hundred dollars. Fifth. All wearing apparel and clothing of the decedent and his family. Sixth. The provisions for the family necessary for one year’s supply, either provided or growing, or both ; and fuel necessary for one year. So when Eula Robertson reported to the court that there was no personal property, what she meant was that there was no personal property that the creditors of the estate could get their hands on. The dishes, the beds, the kids’ clothes — she didn’t have to worry about those. Which is how the estate of a farmer can have no personal property at all. Very interesting topic, one to bookmark. This exemption possibility may be the explanation for some puzzling estates I’ve encountered in 20th century records. Do you have an idea of when the concept of exempting some of the personal assets of the decedent became established? I ask because I’ve read probate records for estates in colonial Virginia and South Carolina where the extremely detailed lists include items the family would have used – “two wooden combs” and “one child’s hat” – which were sold at the estate sale. Then later, say 1850 or so, family wearing apparel seems to be mentioned less frequently. Oh you’re going to hate this answer, but it’s the only one possible: it depends. Every state was different and you’ll need to trace the specific law in the jurisdiction where the estate was probated to be sure. I am almost overcome with laughter. “It depends” is my spouse’s favorite reply. Yes, you are right about jurisdictional differences. They will vary both by location and by era, so there is never a single answer. I really spend a lot more time trying to trace laws in different states since I started reading your blogs. What is fun for me is to discover some quaint law [rarely the one I intended to research]; then I search the state’s digitized newpapers for concurrent discussion of said quaint law before and after passage. Sometimes I glean real insight into what current social ill was the underlying cause for passage. Sometimes, I just learn flowery new ways to say “hogwash.” No matter what, I learn more about interpreting local history. Those are exactly the reasons to poke around in those books! Ange! Good for you! Either Eula was very savvy about the laws of her state or she had a great attorney!